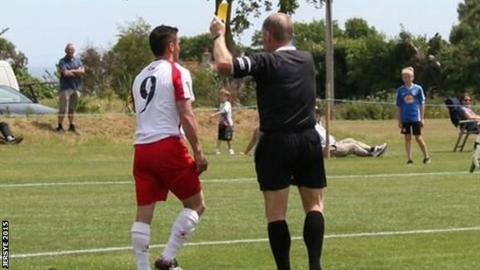 A planned strike by football referees in Jersey has been partially averted. All officials said they would boycott this weekend's games in protest at poor behaviour by players and supporters. But after talks with the Jersey Football Association (JFA) some have had a change of heart. "Some referees will make themselves available and they are free to do so, but others will not make themselves available," Paul Daniel from the Jersey Football Referees' Association said. "We need to try to change the attitudes of the clubs and all the people involved, it's got bad and we've had some serious problems," Daniel added to BBC Sport. It means Saturday's potential league title-deciding match between St Peter and St Paul's will go ahead. But referees are still unhappy over recent incidents, including a physical assault on a match official and an incident where three teenage officials locked themselves in a changing room after a match following "prolonged insults from some junior players, their coach and also some parents/supporters." "We remain committed to reducing indiscipline in local football," a JFA statement read. The statement added that the Jersey FA would "continue to work with referees and clubs moving forward to tackle the problems with a series of new initiatives". Referees threatened to quit in October after a day was dubbed 'Red Saturday' when 10 red cards were shown in 12 games on the island - five for foul and abusive language and two for violent conduct - compared to just four reds in the 54 matches in England's top four divisions on the same day. In 2015 an investigation was launched after Portuguese Club walked off in protest at a referee's decision - they were later suspended and subsequently left the league.